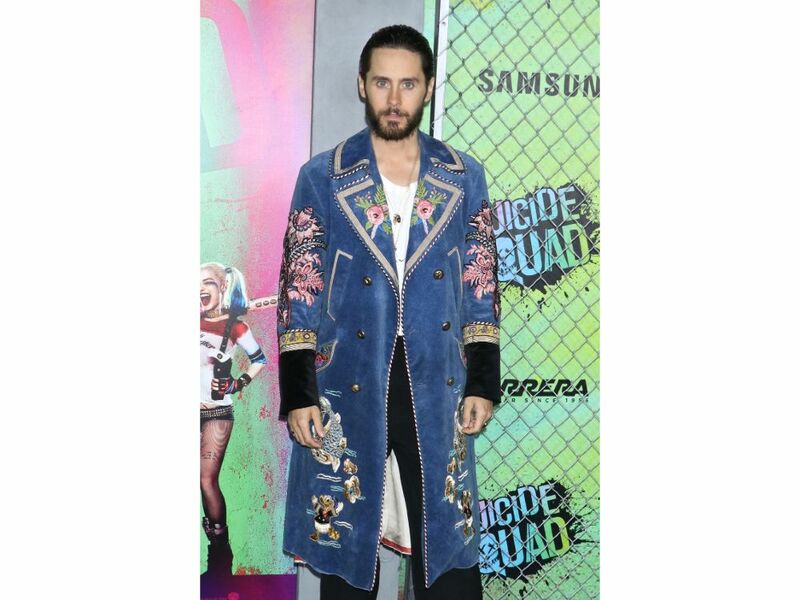 Jared Leto is having a serious love affair with Gucci. Which is good because his, shall we say, avant garde sense of style is bringing some much needed sunshine into our lives. Some blokes would stick to a classic jacket and shirt look for a premier, but not old Jared. He’s taken the sartorial gauntlet and smacked it down. Even the divine Margot Robbie couldn’t outshine these looks. There’s debate in the Marie Claire office about this look. 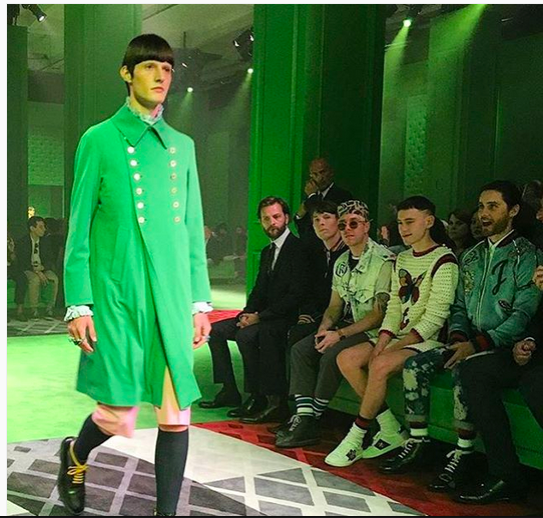 Is it a couture version of Will Ferrell’s Buddy the Elf? Is it an homage to Kurt, the sassiest of the Von Trapp children from the Sound of Music? Or is it a touching tribute to the Colonial war heroes of the American Revolution? 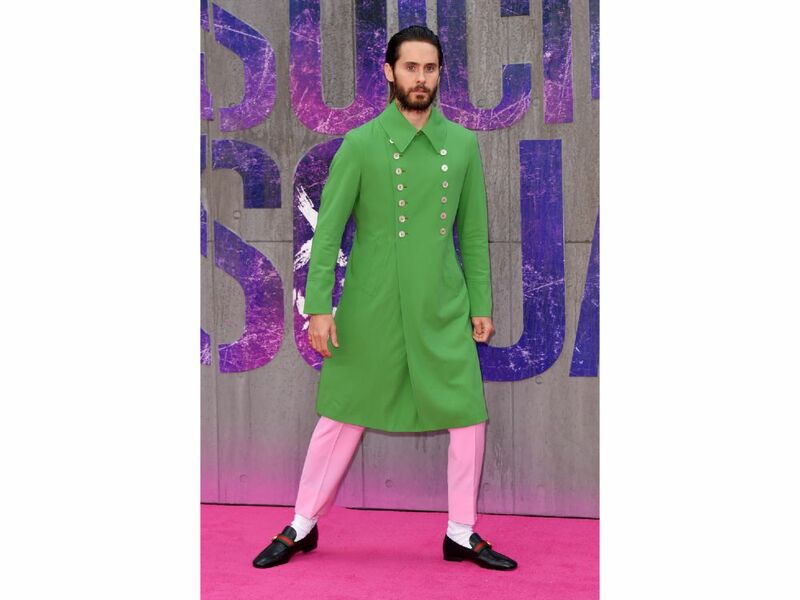 Whatever the etymology of the look, it’s pink tapered trousers with a pea green coat and loafers and we’re not mad at it. BONUS: Here’s the moment that Jared saw his coat on the catwalk and fell in love with it. It’s a moment of the purest, unblemished joy. Like a child on Christmas morning. The coat is Gucci, but we reckon there’s a strong chance that Jared had a spare afternoon to kill so he bought a load of iron-on transfers (remember how fun they were?) and got busy with it. The result? A stunning tribute to the velvet military jackets rocked by Linsay Lohan in the mid 00’s, with a strong flavour of Britney’s denim VMA outfit and just a soupcon of Neo from the Matrix. Divine. Um, why did people stop taking metal topped canes to formal events? We don’t know, but it’s a shame. Drawing inspiration from the ever stylish Slytherin Lucius Malfoy and combining it with the sharp tailoring of an aristo who’d push children out the way to save himself on the Titanic and little sprinkle of Gene Hackman’s Willy Wonka. It’s sharp, it’s chic and the top half looks like he might have nicked it from Maggie Smith’s Downton Abbey costume rail. Love. Gucci, Jared: we salute you. Please keep styling it out like no-one else can.